All of a sudden the winner of the league's worst division is everyone's favorite underdog. Seattle played a fantastic game last week to beat the defending Super Bowl champs. Matt Hasselbeck picked apart the Saints defense and nobody will forget the incredible 8 tackle breaking 67 yard run by Marshawn Lynch any time soon. Today at 1 PM Seattle will travel to Chicago to take on the Bears. These two teams played earlier in the season and the Seahawks won that game. Although Chicago is the higher seed in tomorrow's matchup, after a convincing win over such a formidable opponent it seems like this game could be a really great one to watch. The Bears are going to rely on their physical defense getting to Hasselbeck and forcing turnovers to take the win. However, if the Seahawk offensive line can give Hasselbeck the kind of time he had last week, this is going to be a great game. He'll be looking for resurgent Wide Receiver Mike Williams all day. However a certain pass rusher named Julius Peppers is going to be facing Seattle's rookie Left Tackle Russel Okung and while Okung has looked very good this year, it's a lot to expect any rookie no matter how highly drafted to keep one of the best DEs in the last 10 years off his QB for an entire playoff game. The other key matchup to watch during this game is Bears LB Brian Urlacher against Marshawn Lynch. The Seahawk defense brought pressure from all over last week and it had a huge effect on the Drew Brees and the Saints. I'm confident that they'll try to do the same thing against Bears QB Jay Cutler who is known for being easily frazzled. Which makes the fact that they Bears are in the playoffs, let alone the NFC's 2nd seed despite allowing the most sacks in the NFL this season. Cutler is going to trying to get the ball to WRs Devin Hester and Johnny Knox in space so they can use their speed against a weaker Seattle Secondary. If the Bears can create running lanes for RB Matt Forte and he gets going, this could be a long day for Seattle fans. Ultimately this game comes down to the offensive line. Whichever squad is able to open holes for their Running Back and give their QB time to throw will ultimately prevail. After watching Seattle manhandle the Saints last week, I think they are probably the better squad right now but they'll need that same kind of effort today. Seahawks beat the Bears today 28-23. Today's headliner is the third meeting this season between the New York Jets and the New England Patriots. They split the first two meetings and will play this game on the Patriots home turf. The only injury concern for today's game is Mark Sanchez's right shoulder but it seems that he should be fine to play. Sure there was lots of trash talk and shenanigans going on this week by both squads but that is all just for the media and it's going to be all business once the game starts. The Jets are going to need Mark Sanchez to play mistake free football today. The Patriots defense is ranked 30th in the league against the pass this season so if Sanchez can find his plethora of targets more often than he finds the Patriots it is going to be a good day for New York fans. The Jets' pass catchers Santionio Holmes, Braylon Edwards, Jerricho Cotchery, Dustin Keller, and even LaDanian Tomlinson will have to make sure they don't have any drops either if they hope to exploit the weakness of the Patriots defense. Tomlinson had another very productive year after many people thought he was all but retired. Their other Running Back Shonn Greene got off to a slow start but over the last few weeks he's looked much better. Maybe he just has fresh legs from a lack of work to start the year but whatever it is, the Jets are going to try to use their rushing attack today to eat up the clock and keep Tom Brady off the field. Sometimes it seems like Patriots coach Bill Belichick is doing everything he can to prove to the rest of the world how good he is and this year was no different. He traded away perennial Pro Bowler Randy Moss then picked up a faded Deion Branch. Well over the last half of the season Branch has looked like the old Randy Moss. In fact, since the trade, Moss has had 18 catches for 250 yards and 2 TDs, while Branch has had 48 catches for over 600 yards and 5 TDs. It just makes me wonder if it's all some crazy Bellicheck plot to make himself look like a genius or if he is just a really really good football coach. Either way, the Patriots story is all about Tom Brady this year. He has been the best player in the NFL game in and game out all season long and he has the Patriots playing very god football. Tom Brady and the Patriots are facing a very tough defense today but with the way that Brady has been playing this year, that defense is in for quite a test. He'll have to get all his weapons going because the Jets have tons of talent on defense. Wes Welker and the Tight End duo of Aaron Hernandez and Rob Gronkowski are probably going to be the Patriots best option today because Cornerbacks Darelle Revis and Antonio Cromartie should be able to handle whoever the Pats lineup outside. 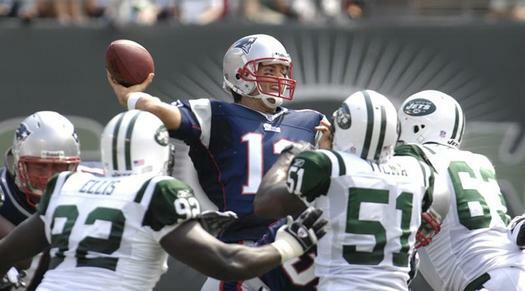 I expect Jet's Head Coach Rex Ryan to dial up lots of pressure in order to limit Brady's time to find those targets. The Jets do have a lot of weapons that are capable of getting pressure on the QB and for the Jets to have any hope today, they are going to have to be in Brady's face all day. Brady has looked so dominant this season that it's hard for me to see how even a couple sacks are going to rattle him. Sanchez will need his game of the year to put up enough points to contend with the Pats offense and I just don't see it happening especially coming off of a throwing shoulder scare. The Patriots win today 35-24.